Although he gave many outstanding performances thereafter, Ronald Reagan’s acting career officially concluded with a two-year stint hosting and appearing in a long-running US television series which recounted tales of the American West. The TV show was Death Valley Days, the title and Western storytelling format of which were copied by writer Jonathan Myerson for the first instalment of The Republicans, a three-part series on BBC Radio 4 that dramatises ‘the political swings of the Republican Party through the personal stories of its presidents’. The first 45-minute episode, broadcast on Saturday 6 October, can be heard here. Ronnie, recognisably voiced by Kerry Shale, is the folksy narrator of a cowboy yarn in which he is the central character. Set in 1964 and 1965, during and shortly after the calamitous presidential candidature of Barry Goldwater, the tale is how ‘a few men formed a new conservative posse, you might say, and rode back into town’. At its head was ‘a trouper from a two-horse town in Illinois who ended up playing a completely different kind of part’, first as Governor of California, an office he held between 1967 and 1975. Earlier this year Kathy Gyngell selected as one of her ‘great conservative speeches’ the address given by Ronald Reagan in 1964. Although it did not save Barry Goldwater from humiliation at the polls, ‘A Time for Choosing’ energised conservatives when Ronnie declared the ‘issue of this election’ to be: ‘Whether we believe in our capacity for self-government or whether we abandon the American Revolution and confess that a little intellectual elite in a far-distant capital can plan our lives for us better than we can plan them ourselves’. ‘They tell me it went down pretty good,’ records the modest narrator. The drama fairly identifies that oration as the speech which prompted California’s Republican power-brokers, casting for a new candidate, to court ‘the actor who didn’t know he was auditioning’. Mind you, in the search for ‘someone people can like’ the kingmakers would already have been aware that Ronnie, although self-deprecating as an actor, could persuasively perform a sentimental homily, as in this episode of Death Valley Days. Wooed by wealthy Californian Republicans led by Holmes Tuttle, but seemingly reluctant to commit to any more than supportive speeches, the humble ‘Hollywood hoofer’ narrates that ‘every good cowboy movie ends with an ambush’. In this production, ‘The Tuttle gang ride straight into their own Little Big Horn’, where metaphorically the big-shots are scalped by Nancy Reagan when she incontestably sets out the intended trajectory of her husband’s political career. Being a BBC production, inevitably the broadcast contains a few moments which grate. Becoming increasingly agitated while watching on television the August 1965 rioting in Watts, Los Angeles, his character exhorts: ‘Lock up the whole place, every last . 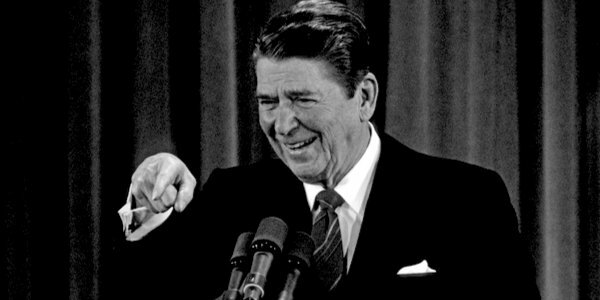 . . one of them,’ a pause which invites the listener to put into Reagan’s mouth a racial slur. And ‘I also play the actor . . . kinda confusing . . . sometimes I even get muddled myself’ is a cheap and unnecessary reminder of when the Left, who foolishly underestimated Ronnie, had branded him a dangerous simpleton. Closing with the dictum ‘The West is where each man makes his own destiny’, Reagan’s character speculates: ‘Maybe one day there’ll be a president who never ran for anything before and I’m guessing he’ll be the very best.’ An example, one assumes, of BBC satire. Ronald Reagan made it to the White House in 1980, which was eight years behind the schedule dictated by wife Nancy in Death Valley Days. However, the delay fortuitously led to Ronnie’s formidable double act with Margaret Thatcher. Overall, the first episode of The Republicans serves as a pleasant reminder of a great president who, in tandem with Maggie, revitalised the Right. It is difficult to select a single fond memory of Ronald Reagan. But when seeking re-election in 1984, at 73 he already was the oldest-ever president. From a time when both his physical and mental fitness for office were being openly and bluntly questioned, let us once again enjoy his masterly riposte. Even opponent Walter Mondale, who knew his presidential hopes had just been sunk, had the grace to laugh at a line which, even though it would have been prepared, was impeccably timed and delivered. Mark up yet another win for the Gipper. Forthcoming episodes of The Republicans will enact events involving Richard Nixon and Gerald Ford. No chance of those names prompting the same affectionate smile evoked by Ronald Reagan.